WAYNE, N.J., March 18, 2015 /PRNewswire/ -- Castrol® announced today a new partnership with Irvin "Irv" Gordon, the current World Record holder for the highest vehicle mileage in a non-commercial original owner car with his 1966 Volvo P1800S which has been driven for well over three million miles. Castrol will promote Gordon's unique story and achievements through the new partnership. When Gordon purchased his new Volvo in 1966, it came factory filled with Castrol motor oil and Gordon has used Castrol for every service over the past 49 years. In fact, Gordon has been using Castrol GTX since the brand was first launched in 1968. His Volvo, which still has the original engine, has never experienced any level of failure despite driving a distance that's equivalent to 120 laps around the world! Gordon first reached one million miles with his car in 1987 and hit the two million mile mark in 2002. Gordon reached three million miles on September 18, 2013 on Alaska's Seward Highway, one of two U.S. states he had yet to visit at the time. Gordon has visited every U.S. state with the exception of Hawaii – making sure to have a cup of coffee in each one. Gordon's record was first certified in 1998 at 1.69 million miles and then again in 2009 at 2.7 million. Presently, Gordon's mileage exceeds 3.1 million miles and he's still going strong, setting a new record with each passing mile. When will Gordon visit Hawaii? "When they build a bridge from California," answers Gordon. "Irv has reached some unbelievable milestones using Castrol products for the past 49 years, so we're thrilled to officially partner with him to celebrate his achievements," said Rob Corini, GTX Brand Manager at Castrol. "The core proposition of Castrol GTX is to help extend engine life and the product has truly delivered on its promise. Irv has been a great supporter of our brand and we're looking forward to continuing the journey together." 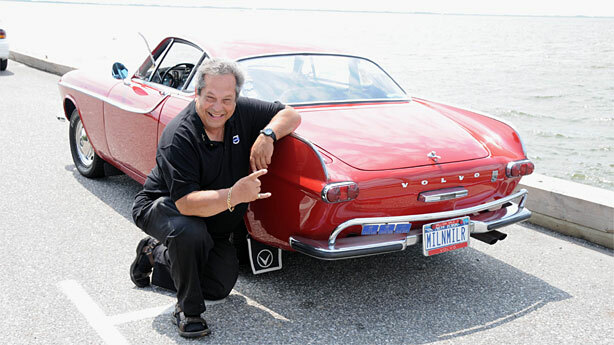 Over the course of driving his Volvo P1800S for nearly 50 years, Gordon has racked up a few interesting tidbits and more than a few stories from the road. He's used more than 112,889 gallons of gas, 3,480 quarts of Castrol oil and performed 870 oil changes. He's driven over 20,000 miles in nine foreign countries and his three million miles equate to driving on every U.S. road at least once. "I've enjoyed literally driving around the world with my car over the past 49 years and Castrol has been with me for every curve on the road," said Gordon. "I've never taken a chance with another oil because Castrol has served me and my car so well for decades." The partnership will include, but not be limited to, in-store and digital advertising campaigns across the globe, positioning Irv Gordon as the "3 million mile man," his Volvo as the "3 million mile car" and Castrol GTX as the "3 million mile oil." The campaign will also work towards helping Gordon reach 3,190,000 million miles – 1,500,000 more miles than his original World Record of 1,690,000 miles.